At seven years-old, I think I already have an established idea that my son's comfort food is this one. How strange it is for a kid to love lentils but his taste for food has not left me wondering anymore. He has a forthright preference to the traditional Italian dishes. For a mother who loves discovering and experimenting new flavors, it can be quite taxing to please him and I also see that he struggles to accept my innovative dishes. So what do I do? I compromise. I fish out the cavolo nero from his bowl before I set it out in front of him but I know that the nutrients of the vegetable remain in the food that he is eating. Putting myself in his shoes, I don't want my ideal comfort food to go through any kind of transformation. It ruins the magic between me and the food and I don't want to be the one who breaks that. His little craving needs to be respected. 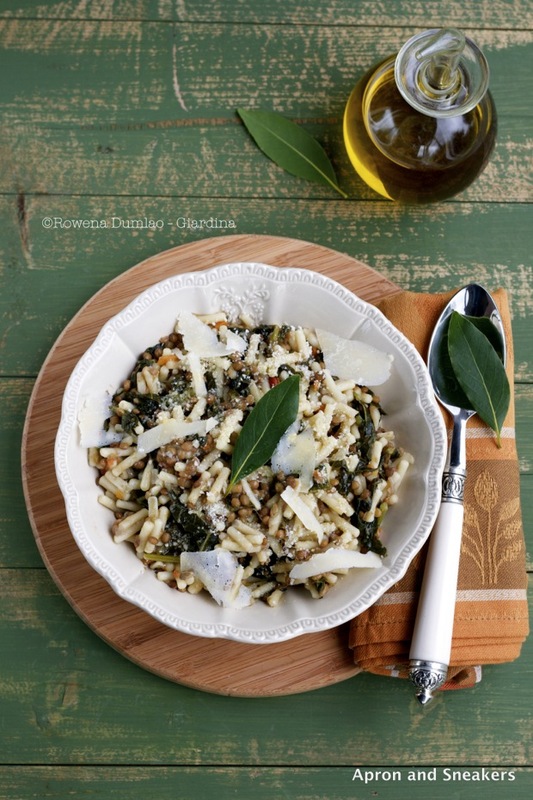 The cavolo nero gave a delicious additional flavor that my husband and I loved. I have read about its health benefits too. I just wish we can have access to this wonderful vegetable more because it's really difficult to find it. 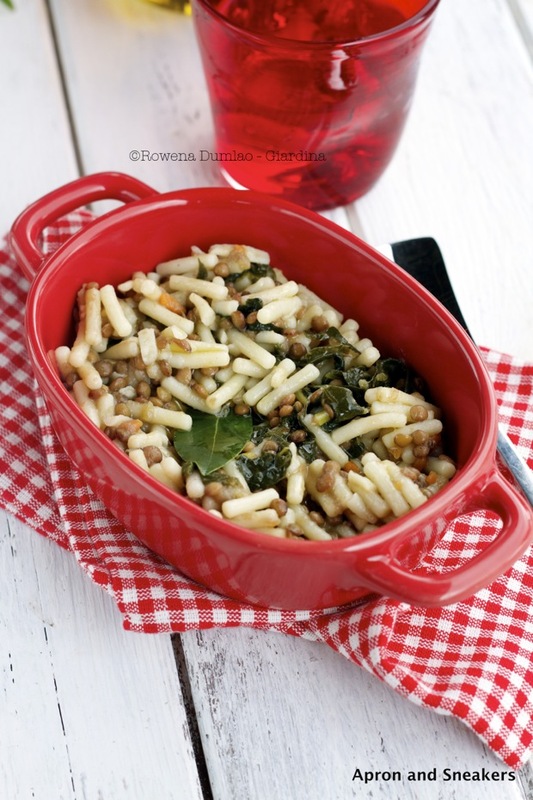 I already posted a recipe of Lentil and Pasta Soup last year and it is very similar to this one. I just adjusted a few ingredients slightly and this one is dryer because it's a pasta dish. Lentils are rich in protein and they are good for our health. 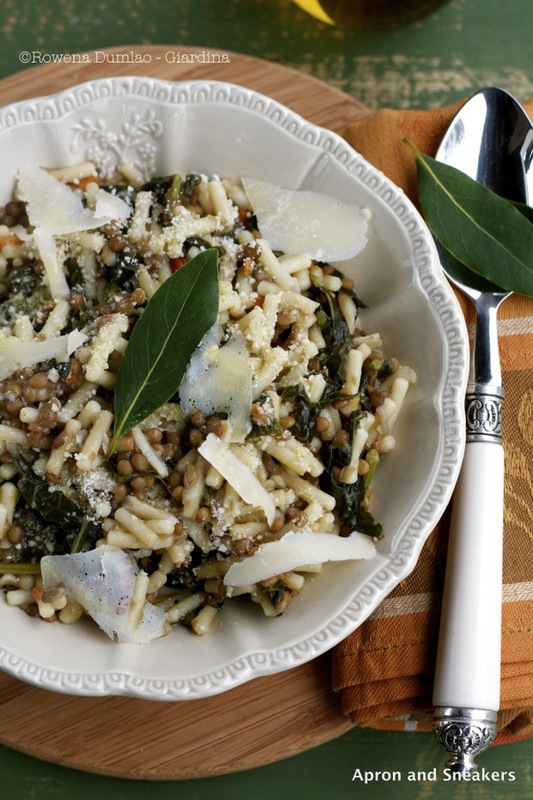 Partnered with kale makes this dish even more explosive with nutrients. 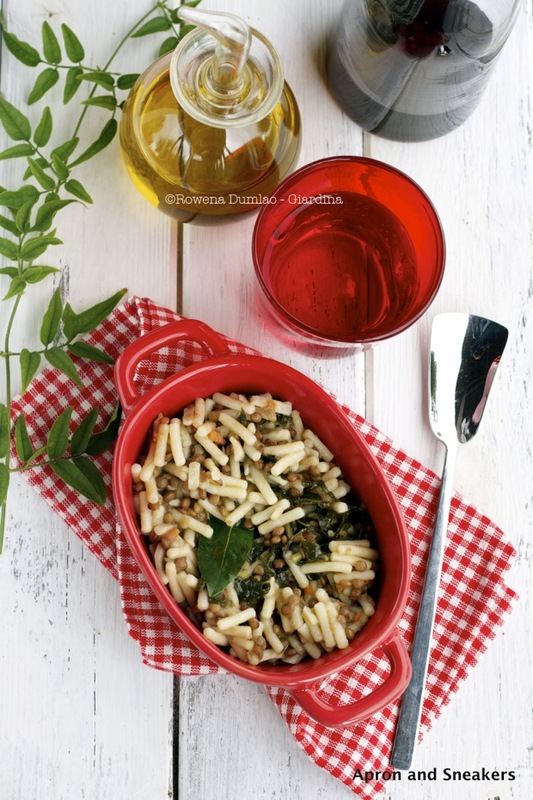 If you also conclude the plate with a good sprinkling of parmigiano reggiano which is very rich in calcium and a drizzling of extra virgin olive oil which is rich in oleic acid, then you are in for a wonderful treat of a good healthy meal. The first prescribed meals that pediatricians give to babies here are cooked vegetables with parmigiano reggiano and extra virgin olive oil. We never broke that healthy habit until now. Hoping you are all having a good week. Buon appetito! Over medium heat, in a saucepan with extra virgin olive oil, sautè the garlic until golden brown, about 2 minutes. Add the onion, carrots and celery then cook for 5 minutes. Add the pancetta then toast them, about 8 minutes. Add the lentils. Mix them to coat with the oil and vegetables, about 3 minutes. Pour the vegetable broth in the saucepan then add the bay leaves and rosemary. Bring it to a boil. When it boils, cover and simmer on low heat for about 30 minutes or until the lentils are tender. Cooking time always depends on the kind of lentils used. If you see that the sauce is drying up, add some hot water. Add the uncooked pasta and kale. Follow the cooking time written at the package of the pasta. Adjust the liquid in the pasta. If you want it soupy, add more hot water. Season with pepper. Add salt if still needed. Drizzle with extra virgin olive oil and sprinkle with the Parmigiano Reggiano (if desired).